In yet anther example that a loosening of the brutish theocratic rule experienced by Iran’s population is still very far from being realised, a concerted attempt to intimidate and prosecute women who choose to appear on Facebook’s Instagram app, and the creative people who work with them, has just been revealed by the BBC. All forms of cultural expression in Iran are still rigidly controlled by the State, despite the election of “moderate” Hassan Rouhani as President in 2013. Iran has arrested eight people working for online modelling agencies deemed to be “un-Islamic”, the prosecutor of Tehran’s cybercrimes court has said. The arrests are part of an operation that has seen women targeted for posting photos showing them not wearing headscarves on Instagram and elsewhere. 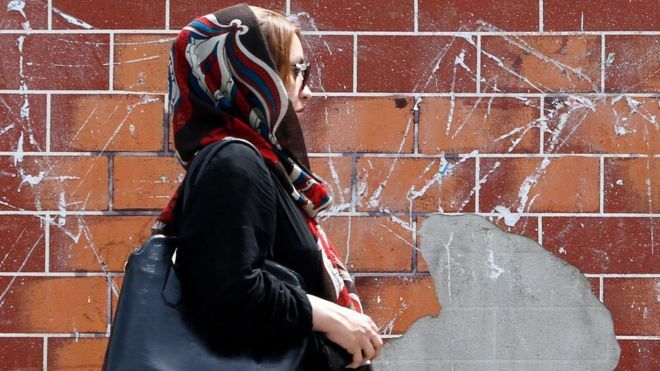 Women in Iran have been required to cover their hair in public since 1979. The eight unnamed people were among 170 identified by investigators as being involved in modelling online. They included 59 photographers and make-up artists, 58 models and 51 fashion salon managers and designers, according to a statement from the court. The arrests were announced by the court’s prosecutor Javad Babaei during a state television programme broadcast late on Sunday that focused on the “threats to morality and the foundation of family” posed by social media. Mr Babaei claimed modelling agencies accounted for about 20% of posts on Instagram from Iran and that they had been “making and spreading immoral and un-Islamic culture and promiscuity”. Of the 170 people found to be involved in online modelling, 29 were warned that they were subject to criminal investigation, the prosecutor added. “The persons who reformed their behaviour after receiving a notice did not face any judicial action, and eight out of the 29 have been arrested,” he said. A spokesman of the Iranian Centre for Surveying and Combating Organised Cyber Crimes, Mostafa Alizadeh, said: “Sterilising popular cyberspaces is on our agenda. We carried out this plan in 2013 with Facebook, and now Instagram is the focus,” he added, saying fresh operations would begin in the coming days. There was no immediate comment from the photo-sharing site Instagram, which is owned by Facebook. Sounds as if there are 29 brave people, and 8 very VERY brave people over there who are heroically fighting against the totalitarian right wing theocracy of Iran. God bless them and protect them – they will need help. These people are being very, very brave. I agree Pat. I am not sure I would be so brave. I hope I never have to find out whether I would be so brave or not. Dominionism and Dominionist “Christians” keep pushing us toward a Christian version of Sharia law, and particularly in some states (they are not all southern states, but North Carolina’s “bathroom bill” comes to mind. That Governor is now suing the Federal Government for saying “You can’t- do that – it’s in violation of the Civil Rights Act.”) Even more than this nonsense, women’s health is suffering. Situations like this, for instance. http://www.patheos.com/blogs/friendlyatheist/2016/04/01/due-to-texas-abortion-ban-woman-forced-to-carry-stillborn-20-week-old-fetus-to-term/ Pure Sharia law. I can’t believe the people of Iran want this. About eight years ago – old, but not ancient – Rick Steves did a show on IRan, a two-part, and there is still a lot of material on his blog. Bottom line, he found that the real people of Iran are much like us (surprise, surprise). Maybe I should specify, like the sane ones among us. Thanks for stopping by an commenting, as always. I find the slide towards religious extremism in the USA to be very depressing and distressing. A country that can produce some of the wisest and most compassionate writings in the world can also produce pure bunkum and intolerance. I don’t think it all starts at the altar, I think it’s also exacerbated by a constant diet of mindless pap in the media – from the country that produces some of the finest creative televisual work in the world – go figure – from the moronic intrusion of religionism into secular education, and so much more. I really do not know what the solution is; I know it isn’t the rampant anti-intellectualism exhibited by those who substitute folk wisdom for learning and bigotry for considered responses.